I was alerted to this new SACD by a review of it in the July/August edition of International Record Review by Mark Pullinger. I hope he will not mind if I draw on his review for some background information since he supplements significantly the rather brief note in the Praga booklet. Realising the importance of this issue, I hastened to acquire a copy. Yevgeny Yevtushenko’s poem ‘Babi Yar’ was published in September 1961 in the Soviet journal, Literaturnaya Gazeta. In the poem Yevtushenko (b. 1932) condemned anti-Semitism and in particular the appalling Nazi massacre of tens of thousands of Jews in Kiev during World War II. His imagination fired, Shostakovich proceeded to set the text as the first movement of a new symphony and he used four more Yevtushenko poems in the other four movements of the work. That much is in the Praga booklet but Mr Pullinger adds that ‘Fears’, which is the text for the fourth movement, was written specifically for the composer to use in the symphony. The run-up to the première became increasingly fraught, with the Soviet Premier, Nikita Krushchev and one of his leading acolytes denouncing the symphony, and the ‘Babi Yar’ text in particular. Nonetheless, the first performance duly went ahead on 18 December 1962 though no texts were printed in the programme and Pravda carried no review, merely a one-sentence report that the première had happened. Mark Pullinger adds some crucial information. Yevgeny Mravinsky, who had premièred several Shostakovich symphonies declined to take on this one with a rather specious excuse. It was even more difficult to secure a bass soloist. No less than three potential soloists excused themselves, the third one on the very day of the première, so it seems that Vitaly Gromadsky was, effectively, the fourth choice. Fortunately, I understand Kondrashin had rehearsed him just in case. So you might think that we have here the second-choice conductor and the fourth-choice soloist. Don’t be deceived: both are fully worthy of their assignments and in particular the conducting could not have been in safer hands. Kondrashin had led the long-delayed first performance of the Fourth Symphony almost exactly a year earlier and was a seasoned interpreter of Shostakovich’s symphonies, all of which he would go on to record between 1965 and 1975. Incidentally, Kondrashin also set down The Execution of Stepan Razin in 1972 as part of his series of Shostakovich recordings and Gromadsky was his soloist on that occasion. Gromadsky deserved that latter assignment: as with the Thirteenth Symphony he stepped in at short notice to sing in the first performance of Stepan Razin in 1964 when the scheduled soloist got cold feet and backed out at the last minute. I gleaned this information from Dominy Clements’ comprehensive review of Kondrashin’s symphony cycle. What is preserved here is said to be a live recording of the second performance, which took place two days after the first performance. However, I do have a nagging doubt or two about the provenance. Everything I’ve read about this symphony indicates that the second performance was cancelled because the Soviet authorities took such exception to the text. Indeed, Praga’s own booklet note seems to hint at this for we read that “Soon after [the premiere] word leaked out that a second performance had been postponed, due to the illness of a soloist.” Did a second performance really take place on 20 December 1962? I could hear no audience noise and there’s no applause at the end. After the furore surrounding the première it was made clear that further performances would be ‘discouraged’ unless Yevtushenko altered the text of ‘Babi Yar’. This he did, presumably under protest, making some small changes that, in the Praga booklet’s words, indicated ‘that not only Jews were slaughtered in Kiev and that the ‘Russian’ people fought the Nazi beast with solidarity during the war.’ When the score was published in 1971 the changes to the text had been incorporated. The performance on this disc apparently uses Yevtushenko’s original text. Leaving aside any reservations as to whether or not the performance is, as claimed, from December 1962 it is still a very good one indeed. In the first movement, the setting of ‘Babi Yar’ itself, the choir of basses, who throughout the work sing mainly in unison or occasionally in octaves, establish a grim, oppressive mood and when Gromadsky starts to sing he projects his bitter, tragic words and music powerfully. He lightens his voice a trifle – but only a trifle – for the section that refers to Anna Frank (7:22). The astonishing section (from 8:22) that starts with the chorus’ dire warning ‘They’re coming’ is menacing indeed and it leads to a massive climax that here is harsh and deliberately strident. This whole movement is savage and ominous and Kondrashin and his forces convey that in spades. That said, I think his 1967 studio recording offers even more. The recorded sound is better, presenting much more detail and, above all, a more firmly delineated orchestral bass line. But the key difference is the contribution of the bass soloist, Artur Eisen. Good though Gromadsky is – and he’s very good – Eisen is even better, especially in the greater variety of tone, colour and expression that he brings to the music. Those comments about the two soloists and the respective recordings apply throughout the performances. The second movement, ‘Humour’, is brash and biting. This is fierce, brittle music and Kondrashin and his performers really dig into it. Gromadsky’s singing is sardonic and bitter. The last three movements follow each other without a break. Kondrashin ensures that ‘In the Store’ is oppressive and chilling. This is extraordinary music, gaunt and harrowing, and this searing performance does it full justice. Then comes ‘Fears’, the setting of words that Yevtushenko wrote specially for this symphony. When we reach the passage about fear of informers (from 4:22) there’s frightening intensity in the music – and in the performance – while the passage that begins ‘I see new fears arising’ (from 7:15) is really graphic. The performance is tremendous, though on the 1967 recording Eisen is absolutely riveting here. What are we to make of the finale, ‘A career’? Superficially, the music that opens the movement and which recurs a couple of times later on, is light in tone – I’m reminded of the comparable movement in the Eighth Symphony. But as with that earlier masterpiece there are worrying undercurrents. When the soloist and chorus begin to sing there’s sardonic irony in both the words and in the music. Gromadsky is very impressive here, especially in the Galileo episode. If we are indeed listening to the second performance of the symphony then this is an extremely important document. But even if there’s been an inadvertent misattribution we are still hearing a very considerable performance of the work. I prefer Eisen as soloist but Gromadsky is excellent. On both recordings there’s a razor-sharp, hugely committed response from the choir of basses and from the orchestra. The 1967 studio recording offers better sound, perhaps understandably, but the sound on this present recording is perfectly satisfactory. Reviewing Kondrashin’s 1967 studio recording of the Thirteenth, Dominy Clements noted his that tempi were brisk compared to those adopted by many other conductors. As he justly observed: ’All of this driving exigency makes for a stressful listening experience at times, but this is after all not the kind of music to which you should expect to be able to put your feet up at the end of a working day.’ Just so! It’s interesting to note that this 1962 reading is, if anything, marginally more spacious than the studio reading which plays for 54:09. Frankly, the differences in timings are pretty insignificant; what matters is that both readings are urgent and taut. As the filler Praga offer five of the ten movements from Prokofiev’s Cantata for the 20th Anniversary of the October Revolution; in terms of playing time this is about half of the score. The movements included are numbers 1, 2, 6, 7 and 9. I must say this seems a very odd choice to me. Presumably the movements are taken from a complete recording but the selection seems a bit haphazard. Surely it would have been preferable to find a complete piece of a similar length? It’s also regrettable that no texts or translations are provided for the Prokofiev. As I said when I reviewed a live performance of the complete score a while ago, I don’t feel that the music consistently sustains a high level of invention and I’m far from sure that the musical strong points compensate for the text, over which I have some reservations. There’s no point in apologising for this music, though: if you’re going to perform it you have to go for it. Kondrashin certainly secures a vivid and committed performance: it’s exciting and stirring. This disc is badged as a “Limited Centenary Edition”, which implies that it may not be in the catalogue indefinitely. 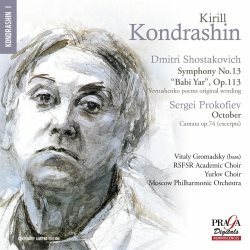 Even if you have Kondrashin’s 1967 recording of the Thirteenth Symphony I’d still suggest this disc is an important supplement for it contains a searing performance by a man who understood Shostakovich’s music instinctively. I hope Praga will follow up this release with some more issues to mark the centenary of this fine conductor. John casts some doubt as to whether this is indeed the second performance of the work, though I believe it is now accepted that a repeat hearing did take place two days later. As you may know this particular recording was first released on Russian Disc RD CD 11 191 in 1993 and then on Venezia CDVE 43218 in 2004. Curiously the inlay for the Russian Disc release gives a recording date of December 20th, 1962 while the booklet notes state that it is the December 18th world premiere, suggesting, furthermore, that the December 20th performance was cancelled! In Gregor Tassie's definitive book, Kirill Kondrashin His Life in Music (The Scarecrow Press, 2010), he lists both the Russian Disc and Venezia CDs as having been recorded on December 20th 1962 and mentions also that both the December 18th and 20th performances were taped by the Conservatoire archive department, 'which was standard procedure for all premieres at the Large Hall'. Now, it is not widely known that the first performance of the Symphony, on December 18th, 1962 with Vitaly Gromadsky, the Moscow Philharmonic Orchestra, and the Bass Group of the Republican Russian Choir, conducted by Kondrashin, was released last year on a Moscow Conservatoire 2-CD set, SMC CD 0162-0163, coupled with the first performance of Symphony No. 4, on December 30, 1961, again with the Moscow Philharmonic and Kondrashin. The Conservatoire has its own archive which holds many exclusive recordings. It has also released a CD, SMC CD 0018, of a performance of Symphony No. 13 [revised texts] with Gromadsky, the RSFR Academic Russian Choir, the Moscow Philharmonic and Kondrashin, apparently made on September (or November!) 20th, 1965. This same performance was previously issued on an Everest LP, SDBR 3181. I have been familiar with both premiere performances of Symphonies Nos. 4 and 13 for some 15 years, having received cassette transfers in the course of preparing my contribution to the Discography part of the late Derek Hulme's Dimitri Shostakovich: A Catalogue, Bibliography and Discography [Third Edition]. Derek undertook an A/B comparison of the December 18th and 20th performances and reached the clear conclusion that while they are very similar (same general tempi, same original texts) there were some obvious differences (not least audience coughs and the applause that breaks out at the end of the first movement of the December 18th performance).